Fish fingers remind me of being a kid. Serve them with chips and spaghetti hoops and I was a happy child. 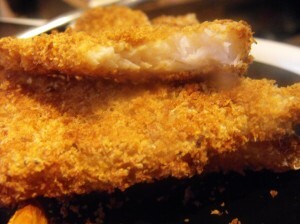 The frozen fish fingers have come a long way since I was younger and a big effort has been made to make the healthier. But, the pre-made ones are still nowhere near as healthy as they can be if you make them yourself. Also, they are really cheap to make and quick to cook. Making them yourself also means you have the advantage of marinading the fish first so it can take on any flavour you want. I would recommend lemon and parsley, but I forgot this time. 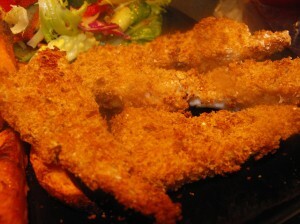 – 1 slice of brown bread, made into breadcrumbs by blending it. 4) Then roll it in the breadcrumbs so it is completely covered. 5) Repeat with each piece and put on a lightly greased (with fry-light) baking try. 6) Bake at 200C for 15 minutes and serve with butternut squash chips and a salad.